This batch of maxi skirts comes with inner lining. Therefore, no problem with VPL. Nice colour. The material is pretty okay and will not fur. The skirt, which comes with a thin elastic band, drapes nicely. Length is good for me too. 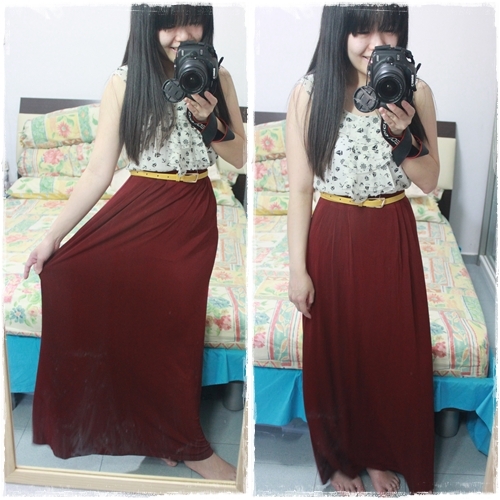 Love it..Size S fits me well. For reference: I am a UK 8, 1.63m. Don't suppose this needs any introduction as it's been reviewed & raved about to death :) Bought this quite some time back but have yet to wear it out hahaha it's my very first maxi skirt! 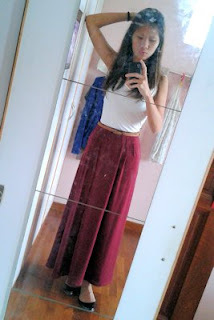 Maxi skirts aren't really my style to start with but I bought it because I loved the wine colour. Super pretty!!!! Nvm hopefully I shall put it to good use soon. Especially love the material used - it doesn't weigh you down plus it's cooling & smooth against your skin. Definitely a worthy buy for S$28.50! design: HAHA!! make yourself absolutely feminine in this! so girly pls! that being said, i don deny the fact that a thicker top tucked in, could possibly see the faint outline of your top though! sizing: truth is, when i first saw the skirt. i am depressed. very depressed. the waist band looks, so depressingly small. 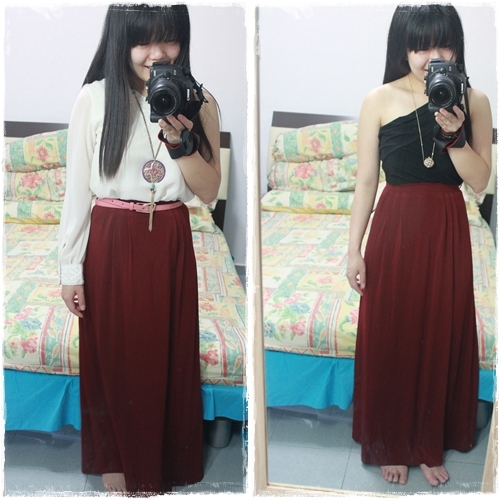 T.T ma chiam, i am gg to spoil the skirt by wearing it. LOL!!! but it turns out that the band is actually very stretchable. i don feel very tight or uncomfortable in it. its fits a wide range of sizes! its a little long for me, i will probably dirty the skirt when i walk. will ask grandma to alter one inch shorter, so that i don have to sweep the floor when i walk! heh. There! Haha i really like the prints on this dress but i hardly wear it out cos it seems a little dressy to wear out for normal occasions. 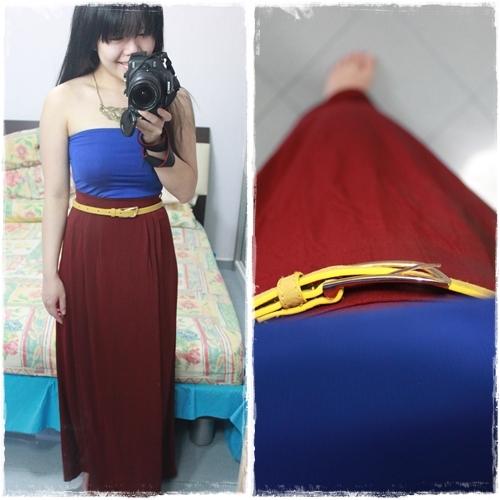 i think it looks quite nice matched with this maxi skirt though! NOW i must start to rave about this skirt - its really super flattering, i especially like how the elastic band is not too thick such that it'll cut into my torso (if you know what i mean). it drapes really nicely and also ends at a good length for me, around my ankles - it's very slightly shorter than my TTR maxi!